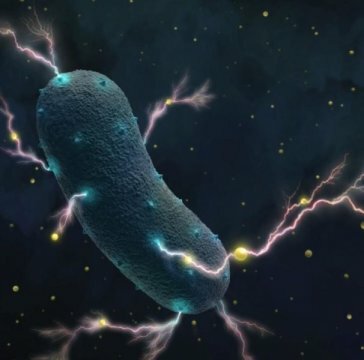 To date, most electricity-generating bacteria have come from weird environments, but researchers have found more than 100 in the human microbiome, both pathogenic and probiotic. They were unsuspected because they employ a different and simpler extracellular electron transfer system, which may prove useful in creating bacterial batteries. Their electrogenic ability may be important in infectivity, or in how they ferment cheese and yogurt. Listeria bacteria transport electrons through their cell wall into the environment as tiny currents, assisted by ubiquitous flavin molecules (yellow dots). While bacteria that produce electricity have been found in exotic environments like mines and the bottoms of lakes, scientists have missed a source closer to home: the human gut. University of California, Berkeley, scientists discovered that a common diarrhea-causing bacterium, Listeria monocytogenes, produces electricity using an entirely different technique from known electrogenic bacteria, and that hundreds of other bacterial species use this same process. Many of these sparking bacteria are part of the human gut microbiome, and many, like the bug that causes the food-borne illness listeriosis, which can also cause miscarriages, are pathogenic. The bacteria that cause gangrene (Clostridium perfringens) and hospital-acquired infections (Enterococcus faecalis) and some disease-causing streptococcus bacteria also produce electricity. Other electrogenic bacteria, like Lactobacilli, are important in fermenting yogurt, and many are probiotics. "The fact that so many bugs that interact with humans, either as pathogens or in probiotics or in our microbiota or involved in fermentation of human products, are electrogenic -- that had been missed before," said Dan Portnoy, a UC Berkeley professor of molecular and cell biology and of plant and microbial biology. "It could tell us a lot about how these bacteria infect us or help us have a healthy gut." The discovery will be good news for those currently trying to create living batteries from microbes. Such "green" bioenergetic technologies could, for example, generate electricity from bacteria in waste treatment plants. The research will be posted online Sept. 12 in advance of Oct. 4 print publication in the journal Nature. Breathing metal Bacteria generate electricity for the same reason we breathe oxygen: to remove electrons produced during metabolism and support energy production. Whereas animals and plants transfer their electrons to oxygen inside the mitochondria of every cell, bacteria in environments with no oxygen -- including our gut, but also alcohol and cheese fermentation vats and acidic mines -- have to find another electron acceptor. In geologic environments, that has often been a mineral -- iron or manganese, for example -- outside the cell. In some sense, these bacteria "breathe" iron or manganese. Transferring electrons out of the cell to a mineral requires a cascade of special chemical reactions, the so-called extracellular electron transfer chain, which carries the electrons as a tiny electrical current. Some scientists have tapped that chain to make a battery: stick an electrode in a flask of these bacteria and you can generate electricity. The newly discovered extracellular electron transfer system is actually simpler than the already known transfer chain, and seems to be used by bacteria only when necessary, perhaps when oxygen levels are low. So far, this simpler electron transfer chain has been found in bacteria with a single cell wall -- microbes classified as gram-positive bacteria -- that live in an environment with lots of flavin, which are derivatives of vitamin B2. "It seems that the cell structure of these bacteria and the vitamin-rich ecological niche that they occupy makes it significantly easier and more cost effective to transfer electrons out of the cell," said first author Sam Light, a postdoctoral fellow. "Thus, we think that the conventionally studied mineral-respiring bacteria are using extracellular electron transfer because it is crucial for survival, whereas these newly identified bacteria are using it because it is 'easy.'" To see how robust this system is, Light teamed up with Caroline Ajo-Franklin from Lawrence Berkeley National Laboratory, who explores the interactions between living microbes and inorganic materials for possible applications in carbon capture and sequestration and bio-solar energy generation. She used an electrode to measure the electric current that streams from the bacteria -- up to 500 microamps -- confirming that it is indeed electrogenic. In fact, they make about as much electricity -- some 100,000 electrons per second per cell -- as known electrogenic bacteria. Light is particularly intrigued by the presence of this system in Lactobacillus, bacteria crucial to the production of cheese, yogurt and sauerkraut. Perhaps, he suggests, electron transport plays a role in the taste of cheese and sauerkraut. "This is a whole big part of the physiology of bacteria that people didn't realize existed, and that could be potentially manipulated," he said. Light and Portnoy have many more questions about how and why these bacteria developed such a unique system. Simplicity -- it's easier to transfer electrons through one cell wall rather than through two -- and opportunity -- taking advantage of ubiquitous flavin molecules to get rid of electrons -- appear to have enabled these bacteria to find a way to survive in both oxygen-rich and oxygen-poor environments.